Beer from Three Weavers, Inglewood's first brewery, will be served at Komodo Venice. Hire an ace brewmaster. CHECK. 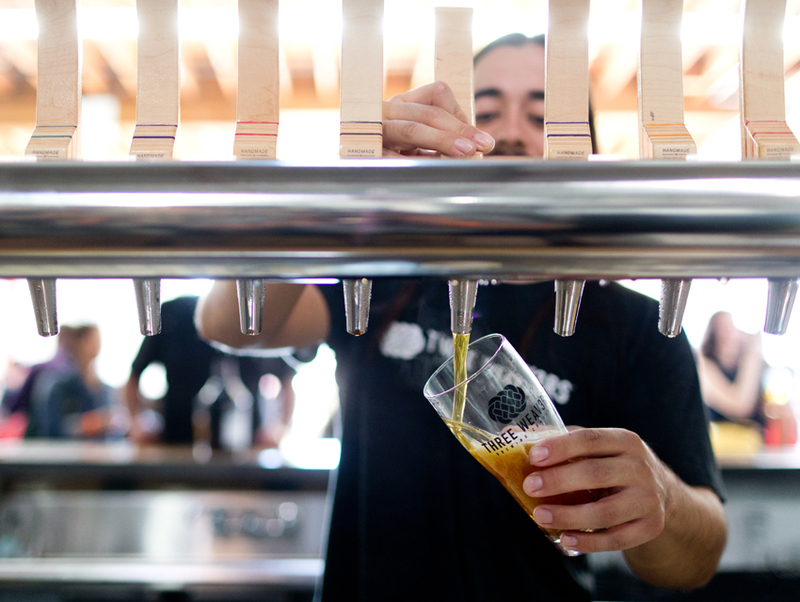 Get support from the local craft beer community. CHECK. “I came to Inglewood kicking and screaming. My real estate agent kept pushing Inglewood, but I had this idea of what the city was.” When the agent finally convinced Weaver to check out a warehouse space near the 405, she fell in love. CHECK. And seriously, you’re going to want to join the ranks of Three Weavers’ extended community of friends and family. When the taproom opens on November 6, delicious offerings like Expatriate IPA (named for some German friends), Midnight Flight Imperial Stout and Deep Roots English ESB will be pouring. That Expatriate IPA is sure to become an instant classic in the West Coast IPA oeuvre thanks to the light touch and expert hand of brewmaster Alexandra Nowell (lately of Kinetic Brewing Company and Drake’s Brewing Company). Growler pours available. Kicking and screaming discouraged. New friends and family welcome.